Sitting all day especially if you have a job is normal. But sitting for hours and hours may give us health issues that we might never notice. Sometimes, we say to ourselves, “Let it be” because we think that there’s nothing we can do about it. Well that’s where you’re wrong. One of the simplest ways to get off from that desk is standing up. Standing is good for you since it allows for a better blood flow circulation compared to sitting. A study by Standford University shows that people who tend to stand during work hours has felt less back pain compared to those who sat all day. Standing is really good for your health as it allows you to move freely while you work. So how can we convert a sitting workstation into a standing one? If you’re on a budget, you could do simple things like propping everything up. Make sure that you prop your desk according to your level. Where your shoulder can be relaxed, your wrist to be supported, and your monitor that’s level to your eyes. Not a fan of DIY? You can always buy standing desks online or at your nearest department stores. Standing desk are portable and can be easily placed at your current desk. Make sure to adjust its level according to your comfortable spot. Not just that, with a standing desk, you can adjust it back so you can switch between sitting and standing. Sounds very convenient right? Pros: DIY standing desks doesn’t require fancy props to use. You can just grab some household items like boxes or pieces of wood and prop it up yourself. Or you can simple buy a standing desk if you want to save more time. Cons: Standing too long might give you some problems. People who are used to sitting might experience a struggle of standing too long. And honestly, being in one position be it standing or sitting isn’t good for you. Improvise for a bit, you can sit during a meeting or walk around your office during a break. Or you can buy an anti-fatigue standing mat to match with your standing desk. Yoga ball chairs is a great alternative from using traditional chairs. 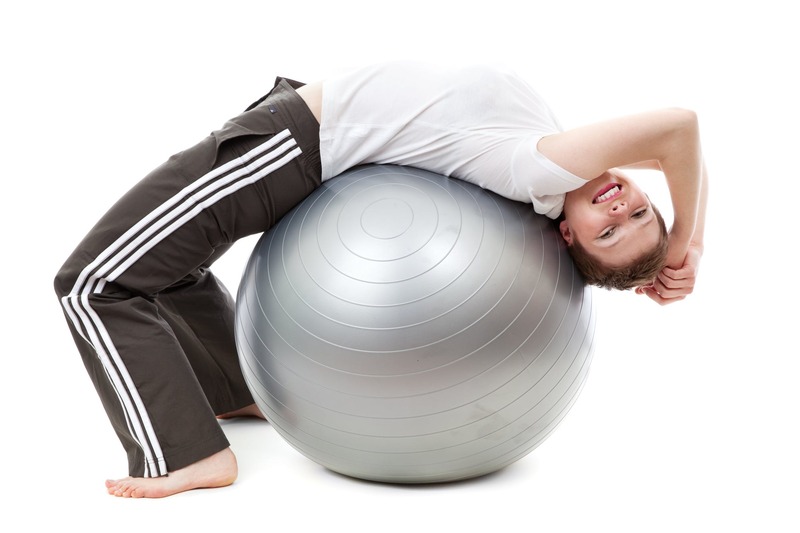 A yoga ball gives you a freedom to move and can help you generate proper posture. It can also help you move different muscles on your body compared to regular sitting. Pros: Yoga balls can help you reduce back pain. It can also help you stay active as you can roll, bounce, and stretch while you work. This kind of freedom can help you stimulate your brain and creativity. Cons: Some may struggle to sit properly on a yoga ball especially those who are used to traditional chairs. They might find themselves falling off the chair due to bad alignment and posture. If you’re one of these people, make sure to properly inflate the ball depending on your comfortability. If you feel that standing desks aren’t enough, the Treadmill Desk is the right thing for you. Most people who worked for almost 24 hours a day don’t have time to do some cardio exercise. With the Treadmill Desk, you don’t have to worry about missing your daily cardio workout. You can work and walk at the same time without the need to go outside. Pros: It’s a great alternative if you want to move more compared to standing desks. Walking while you work can make you productive both in your health and work. You can burn calories while you complete that article your boss gave you. Cons: Treadmill desks might make your wallet cry. It’s also not good if you’re working inside an office full of people. The noise and space might give issues for your workmates and also to yourself. Keep in mind that treadmills don’t mimic natural walking, so you might end up having micro “falls” that’s not good for your body. Feeling tired while using your standing desk and the treadmill isn’t the right choice for you? A Balance board got you covered. A balance board combined with a standing desk can help you stabilize your muscles as you work. You can use a traditional balance board or if you want to get more fancy, you can get a FluidStance board instead. Pros: Balance Boards are portable and can be carried around everywhere. You can easily store them under your work desk without taking too much space. It also pairs great with a standing desk so you can have fun while getting your work done. Cons: It might distract your concentration from your work. Using balance boards takes some time and practice. You might find yourself slacking while you work since you’ll be concentrating to keep your balance all the time. SomaFit is one of the simplest solution that you can use for your “sitting all day” problem. With SomaFit, you can get 5, 10, or even 25-minute workout classes that’s designed to keep your body energized while you work. No need for all those fancy equipment and workout attires that cost too much. All you need is yourself and you’re ready to go. Pros: It’s more effective and can help you move and do more compared to standing or treadmills desks that costs too much. Even if SomaFit workouts are short, studies have shown that it’s just as effective as longer workouts. It also costs less than your monthly gym, with just a single pay, you can get a lifetime access of SomaFit’s 250+ workout classes. Cons: SomaFit doesn’t come with a notification system yet, so you have to set an alarm to remind yourself to start working out. There are many workout alternatives that you can do than just sitting down while you work. Being busy on your job isn’t an excuse that you can’t workout anymore. Always remember to take a break and move those muscles to keep a more vibrant and healthier lifestyle.